Spring has sprung and I’m breaking down large pieces into small pieces for my standing had tool cabinet. The winter was not kind with temperatures, so this is really the beginning of the serious work on the thing. I’m cutting 8/4 slabs with a Skill Saw, supported from underneath on sawhorses, and then using the band saw to get them near final dimensions and letting them sit for a while to acclimate in the shop. The back table pictured has several rails and stiles on it, the top few oiled with BLO to see the color of the Elm I’d selected. Next, I’ll cut the mortise and tenons, do a dry fit to see the case work of the bottom half put together, and to measure for cutting the panel pieces to fit inside them. The front doors are going to be about 20” wide each, and I haven’t yet made a firm selection for those panels. I have to get my wood all out where I can see it clearly to find best faces for doors. One thing at a time! WOW !!! Can’t wait to see it. How about making a blog ? Great start Barb, I’ll be following you on this one! Great choice of wood, Elm is one of those underrated but beautiful woods. I have some nice stuff stashed. Here is to warmer weather and more fun in the shop. Looks like a lot of work. Have fun. Where I live in the western USA we’ve had little snow or rain. we were enjoying 40-70 degree weather. My Mother (90 years old) said plant cold weather crops now. That was over 2 months ago. Problem is we are now in a drought situation. I agree on the blog, please. Thanks for the encouragement. This is entry #2 of my LJs blog, and I’ll keep alerting you with updates. For the complete process and my previous posts of plans leading up to it, check my BlogSpot listing in my signature line. All comments are most welcome! Can you stand another WOW! 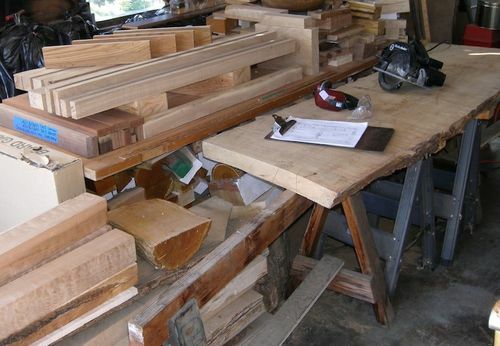 What a beautiful pile of wood… knowing you, it will become something pretty special! Can’t wait to see what you do. Great start Barb. I’ll be watching. I cant wait for the results! Yea for spring. This looks like a good one coming up.